What would Earth be like in the absence of elephants, gorillas and other large, plant-eating species roaming its habitats? According to a frightening new analysis from a group of 16 international researchers, we're dismayingly close to finding out. Out of a group of 74 large, terrestrial herbivores -- from bison to rhinos to hippopotamuses -- about 60 percent are on the fast-track to extinction. The loss, the researchers write, puts us at the cusp of transforming much of the world's desert, grassland, savanna and forest ecosystems into "empty landscapes." The data comes from the International Union for the Conservation of Nature (IUCN), which keeps track of threats to species with its Red List. The researchers looked more closely into the challenges facing large herbivores, specially, and what they say are the often understudied impacts of their loss on entire ecosystems. Most of these species, they note, have already disappeared from North America and Europe; those that remain, in a threatened state, can mainly be found in developing countries, including southern Asia, extreme Southeast Asia and across Ethiopia and Somalia in eastern Africa have the highest concentration of at-risk species. African elephants, in that first example, convert woodland to shrubland, increasing the vegetation available for other herbivores, and clearing the way for large predators, like lions, to more effectively hunt. They damage trees, creating a complex habitat perfect for communities of lizards. They eat seeds, and poop them out later, often far away, allowing for the dispersal of plant life. 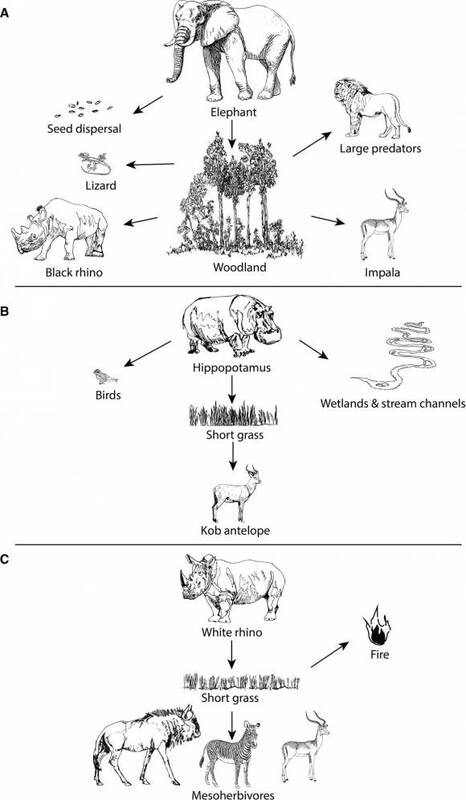 "Large herbivores shape the structure and function of landscapes and environments in which they occur," the authors stress, playing critical roles that "cannot be taken over or compensated for by smaller herbivores." 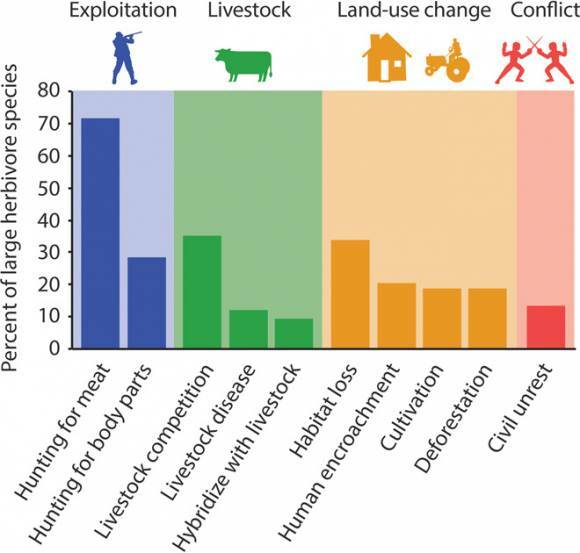 Those effects extend to humans, as well: an estimated one billion people subsist on wild meat, a nightmare for food security if that meat's availability declines, as it will in a business-as-usual scenario, by as much as 80 percent by 2050. Many others don't eat these creatures but instead travel to protected areas to see them -- the authors warn that the tourism industries, which play an important role in the economy for many parts of the developing world will falter with the species' decline. They call for a "concerted effort," addressing everything from poaching to habitat destruction to climate change -- which threatens as many as one-sixth of the world's total species with extinction -- to counter the threats. "The scale and rate of large herbivore decline suggest that without radical intervention, large herbivores (and many smaller ones) will continue to disappear from numerous regions with enormous ecological, social, and economic costs," the authors warn. "Now is the time to act boldly, because without radical changes in these trends, the extinctions that eliminated most of the world’s largest herbivores 10,000 to 50,000 years ago will only have been postponed for these last few remaining giants."